When I mentioned in a text message that I was going to watch Greenberg, the response was “that’s a terribly awkward movie.” A half hour in, I agreed. Director Noah Baumbach’s leads us on yet another melancholy dramady centered on white people with problems. And Roger Greenberg (Ben Stiller) has problems. The titular character is a hyper-vigilant failed rock star turned Brooklyn carpenter who writes complaint letter daily. He’s frostbitten, neurotic, middle-aged recovering mental patient who arrives from New York to housesit his brother Philip’s house in LA. Phillip (Chris Messina) and his family are visiting Vietnam for an undisclosed reason. Ben Stiller is quite believable the title role. The residue of Stiller’s perpetually awkward family comedy roles actually works with him here but the only laughs here come from a viewers’ discomfort as Greenberg fumbles through every moment of his existence. Unlike most people who mask their pain, Greenberg can’t help but demand his pound of flesh. To spend time with him is to hurt with him. But Greenberg isn’t alone at in the center of this film. His relationship with Florence is fleshes out the storyline. Gerwig’s gate grants any caring soul a glimpse at a lost soul. Her untold back-story has scared her leaving her vulnerable constantly unnoticed and typically unappreciated. She’s as sensitive as Greenberg, yet she’s measured and never lashes out. Florence is the type of person who overhears an argument and reacts like she was in it. While Roger constantly voices his awkwardness and agony, Florence awkwardly floats through life, silently screaming. 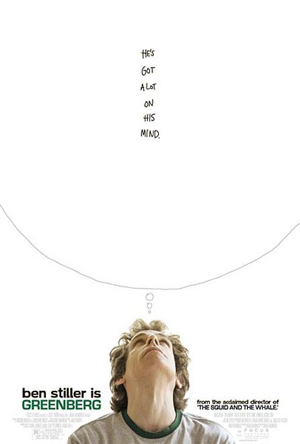 The trouble with Greenberg is that he’s all heart and no head. The same could be said for the film with mixed results. For better or worse, the film works as a mood-piece and as a character sketch. Roger is and Florence are chiseled in a mid twenties malaise. Fifteen years in, Roger is bitter while Florence is almost painfully sweet. Neither character knows how to stray from their dominant traits. All of which have led them into uncertainty, loneliness, and each other. Florence just wants to be loved someone even if it’s a hyper-needy powder keg like Greenberg, who doesn’t want to hurt anymore. But where is Greenberg’s intelligent design? Greenberg lacks plot, direction, growth or decay. Baumbach opts to mope in an awkward plot-less meditation evoking the characters hurt and awkwardness at every turn. Baumbach’s script (co-written with Jennifer Jason Leigh) assumes that this degree of hurt at least for these characters is part of a permanent condition with no solutions. With no crescendo, Greenberg leaves you feeling empty. There was no there, there.